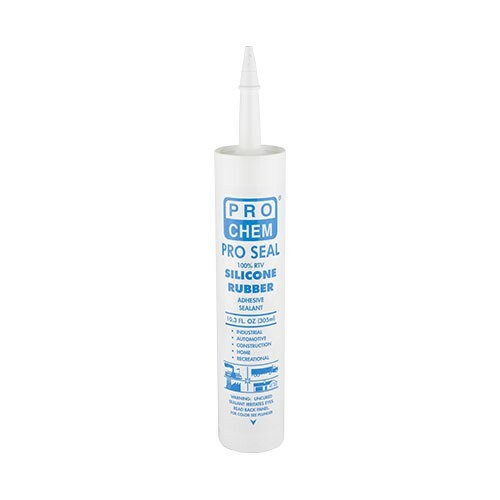 Pro Seal | Pro Chem, Inc. PRO SEAL, a 100% RTV silicone, is a one-component sealant that cures to a strong durable resilient rubber. PRO SEAL is resistant to sunlight, rain, sleet, snow, ultraviolet radiation, ozone and temperature extremes. It will adhere to glass, metal, most types of non-oily woods, ceramic, paper, as well as many painted and plastic surfaces. Because it does not flow due to its own weight, PRO SEAL can be applied overhead or on sidewall joints without sagging, slumping or running off. Clean and dry surfaces. Completely remove all dirt, grease and soap. Cut nozzle at desired bead size, apply bead of silicone at a 45° angle. Most paint will not adhere to silicone. Surface should be painted first, then sealed. Silicone “skins” and becomes tack-free in 10-20 minutes, cures in 1 hour. Allow 24 hours for full cure and strength. Note: This sealant is not paintable. Do not use for head gaskets. Not suitable for below-waterline marine applications.